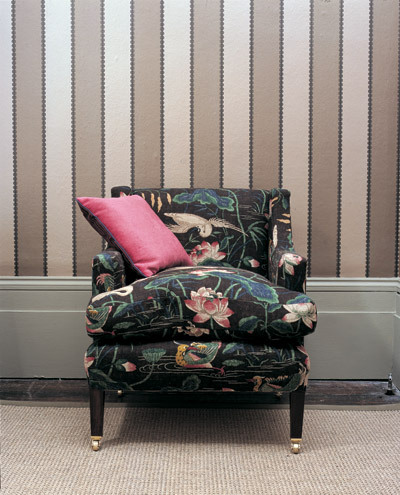 Wallpapers by GP & J Baker - Valention Stripe Flock. The Interior Library, Dublin. Wallpapers, Fabrics, Curtains, Trimmings. Interior Design Trade showroom, Dublin, Ireland. Interior Designers Dublin. This beautiful paper with small flock detail is from the new Emperor's Garden Wallpaper collection for 2009. G P & J Baker has been producing beautiful prints and weaves for over 100 years. More than a century of discerning collecting has produced one of the most exciting and largest privately owned textile archive in the world. Designs from this rich resource are skilfully adapted to meet with today's transitional tastes and colour palettes and are complemented by luxurious and eclectic weaves. Today, in addition to developing its own traditional style and unique "handwriting" G P & J Baker continues to grow its reputation as one of the world's innovators of fabric design and colour.